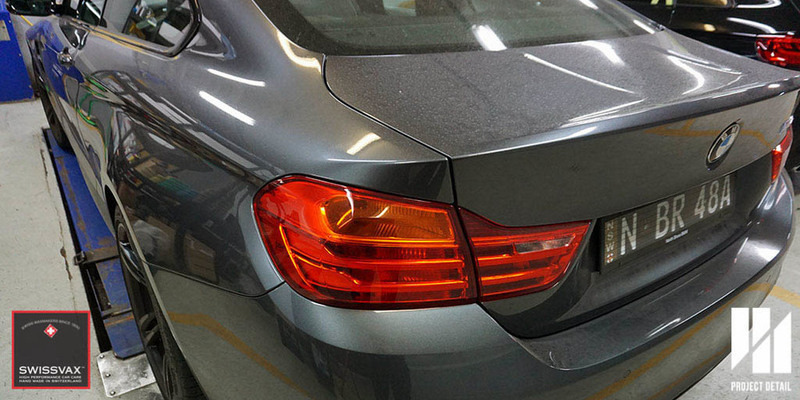 Project Detail is Sydney's only authorised Swissvax Car Detailer. This bespoke range of Car Care Products when Combined with our specialised Detailing Studio in Gladesville, Sydney produces fantastic results for clients looking for the best detailing for their vehicles. BMW M4 - Swissvax Full Detail finished with 'Blau-Weiss' hand made wax. 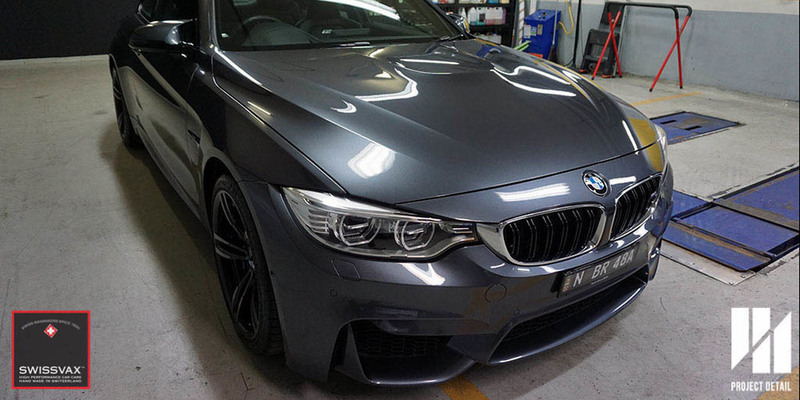 The owner for this BMW M4 opted for our Swissvax Full Detail as a means of revitalising their coupe. The car looked very tired, had water marks, calcium and mineral deposits on the surface and general build up of dirt and debris across the entire vehicle. 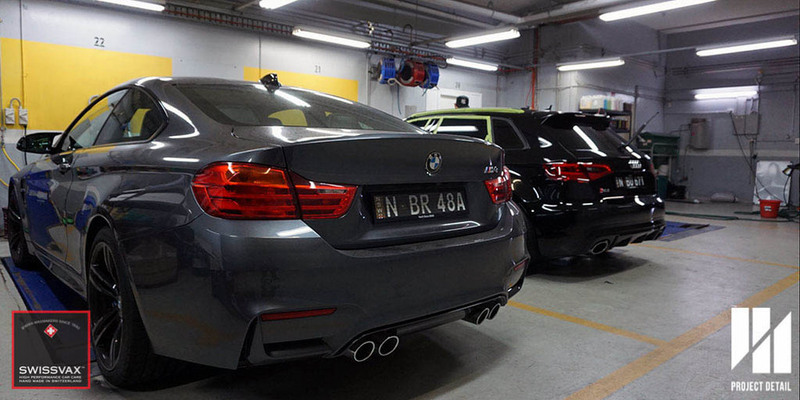 The M4 underwent our 21-stage wash and decontamination process with the major change being that we utilised Swissvax products for each stage of the Full Detail. Swissvax is top tier car care range which utilises hand made products manufactured in Switzerland. What we covet about Swissvax is their bespoke approach towards different makes and models, providing waxes for different paint finishes or different leather materials to achieve the best results. The BMW responded very well to the Swissvax Full Detail, all the mineral deposits were broken down and removed safely and the paintwork looked immaculate even before we applied the wax 'Blau-Weiss' to finish. The wheels were also removed and deep cleaned with our hoists and a coat of Swissvax Autobahn wheel wax was applied in order to bring the best out of the gloss black finish and provide protection on the rims for the owner. If you are looking for quality detailing for your vehicle and you are not looking for more long term options such as Modesta Glass Coatings, consider our Swissvax Full Detail. It will treat every component of your vehicle with the highest quality care care product range. Our Swissvax Full Detail not only uses all Swissvax products but the engine bay was washed, detailed and waxed. Even the rubbers & plastics were treated with Swissvax Seal Feed & Pneu. Blau-Weiss, hand made for BMW Paintwork. Stunning results from our Swissvax range. To find out more about our Swissvax products, click here to see the range. To find our more about our detailing services, click here to see how we can help your vehicle look its best. If you have any more questions regarding Swissvax, car detailing or general questions, we can answer your emails here. How to choose between a Wax, Sealant or Ceramic Quartz Coating? Chapter 2 -Not all paint protections are the same. Project Detail Sydney & Melbourne focusses on prestige car detailing and customisation, but unlike many others we enjoy sharing our knowledge so that all enthusiasts or car owners can benefit from know how to better take care of their car. Project Detail has a running series of articles designed to inform and educate the car owner on paint protection. Part 1 of our series can be found by clicking here. In Part 2, we are going to cover the main differences between a wax, sealant and ceramic quartz coating to give car owners a good overview on the 3 protection options and type that suits individual car owners the best. In Project Detail, we offer all 3 types of Paint Protection. It is important to understand that 'Paint Protection' can be a wax ... it also can be a sealant and most definitely some type of coating. The importance, is knowing the key differences between the variations. Choosing between the types of paint protection can be overwhelming for car owners and usually have thousands of unanswered questions, we are here to help. One of the most common questions we get asked at Project Detail is what is Paint Protection and what is the main differences between Wax, Sealant and Paint Protection Coating. To simply put it, it depends on what is the vehicle's purpose and results you are looking to achieve. 1953 Allard J2X, finished with a Teflon based sealant after a multi-stage Paint Correction. Swissvax is a premium range of waxes. Project Detail is an authorised applicator. Waxes are the most traditional form of waxes. Although there are thousands of variation of waxes, they are usually only two types of waxes. Natural wax are usually more expensive and they provide a warmer, deeper finish. They are usually referred as Carnauba wax, which derives from the copernica cerifa plant in Brazil. These natural waxes usually have a percentage of carnauba. The carnauba content can either be in a pure form, or mixed with oils or petroleum products to certain degrees. Carnauba content and how pure it is plays a huge role in how much they cost. Natural waxes are usually the most expensive waxes. They usually comes in a paste format. Most of the car waxes on the shelf in auto stores are usually synthetic waxes. How are they different from natural wax you may ask? Synthetic wax are design to do the exact same thing with natural waxes, but instead of using natural content such as carnauba, they are made from non-organic chemicals. They usually comes in a liquid or spray format. Advantage being it's a easier to apply compared to natural wax and it is usually cheaper compared to natural wax. Vast majority of the sealants you can find on the shelf of your local auto store are usually a polymer sealant. A polymer sealant is made up of tens of thousands of synthetic particles that are linked together. When a polymer sealant cures, it is basically forms a 'plastic' shield on the vehicle's paintwork - glossy and slick. The best kept secret in the detailing world would be applying natural wax on top of a polymer sealant for a extremely deep and glossy finish. Note - Many dealerships in Australia, that sell a form of paint protection is more then likely a Polymer Sealant. PTFE based sealants works exactly like a Polymer sealant, but with a different kind of polymer. You'll find non-stick PTFE coating for pans and other cookware. It is very non-reactive, partly because of the strength of the carbon–fluorine bonds. Research shows that PTFE technology works excellent on car's paintwork and it fills or 'hide' paint imperfections well for those who are not going through an extensive paint correction but rather wants it to look good for a day or a pre-sale presentation to potential buyers. Although it generally won't last as long as polymer sealant, it provides a glossier finish as compared to polymer sealants and are generally more expensive compared to polymer sealants. Superb & Stunning - Audi RS3 Coated with a Ceramic Quartz Coating. Ceramic quartz coating, or often referred as a nano coating, is a ground breaking improvement in the automotive industry, it has existed for many years with a recent spike in popularity and brands in the past few years. It uses Silicon Dioxide or SiO2 (aka Ceramic/Quartz/Liquid Glass) that cures into a hard glass that provides superior protection. It severely outperforms sealants in every single way. The 4 main advantage of a coating is: Gloss, Longevity, Physical Resistance and Hydrophobicity. A good coating applied properly by a detailer with appropriate prep work, it could last anywhere from 2 to 5 years and it eliminates the need to wax or polish your car again. Did we mention it has self-washing effects from the hydrophobicity in the coating. Even so, natural waxes finishes better than a coating due to its carnauba content. Although there are plenty of coatings to choose from, there are two types of coating: Consumer and Professional-only coating. 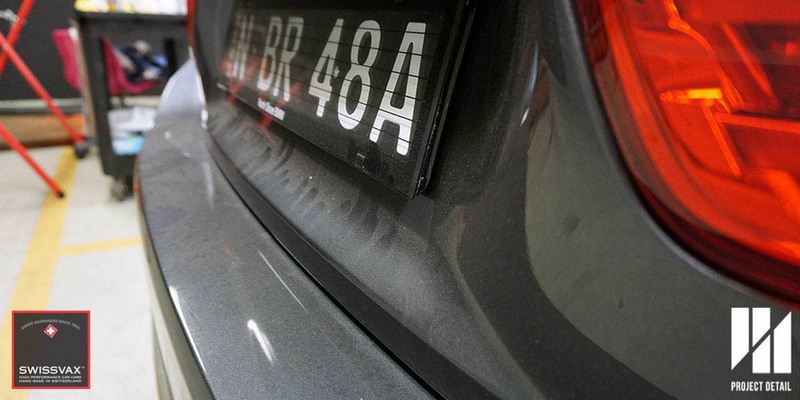 Due to coating's complexity of application, we do advise car owner's to do extensive research about coatings and how to apply them, because once the coating is applied and cured, it can be only be removed via abrasion only. A consumer coating is a simplified and easier to apply version of a professional-only coating, targeted to weekend warriors and car enthusiast that are keen to apply a coating by themselves. A consumer coating usually have a lot less SiO2 content, more user-friendly, a lot easier to apply and usually a shorter lifespan as compared to professional-only coating. Professional-only coating are usually coatings that are not available to purchase to the public and are exclusively available to selected detailers. Selected detailers usually have to attend a training session to properly learn how to apply the product professionally to prevent any errors and quality control. Each individual professional-only coating has its own unique way of preparation process to optimise the best results from each application and usually paint correction is needed to remove existing imperfections such as swirl marks and minor scratches. The main difference between a consumer version and a professional-only coating are mainly the SiO2 content and the solvent a coating carries. The higher the SiO2 content is, the more difficult it is to apply and precautions has to be taken into account. Pro Tip: SiO2 percentage has becoming a marketing hype in the industry. So if you see a consumer coating claiming to contain 80% or more SiO2 content in a single part and you feel that it's too good to be true? Then it probably is. A Professional-only coating usually contains anywhere from 75% to 85% SiO2 Content. Menacing Mercedes Benz C63S Estate protected with a Ceramic Quartz Coating. Porsche 911 (997) Carrera 4S in Black - Coated with a Ceramic Quartz Coating. Wax (Natural or Synthetic) provides a deep, warmth finish, however it usually only last about 2-3 months. It is best suited for show cars on car events or those wanting the best shine. See our Swissvax Wax range for more information. Sealants provides a better protection and longevity compared to wax, but it doesn't provide natural wax's warmth and deep finish. It is best suited for car owners that are looking for a affordable paint protection solution. Ceramic Quartz Coating provides a superior protection and longevity compared to sealants and increased gloss levels close to waxes, cost of getting it professionally applied by a detailer will be higher due to extensive preparation required such as paint correction. This is best suited for daily cars, and car-lovers that wants the best value in the long run. If you would like to know more about the paint protection options Project Detail offers, click here. We hope this article helped you on choosing the best paint protection option for your car. For any enquiries, feel free to contact Project Detail by clicking here. Project Detail is Sydney's only official and authorised Swissvax Applicator. We are excited with our relationship with one of the worlds most prestigious car care brands and feel we both share the same philosophy in simply wanting the best for our clients and their vehicles. Porsche Cayenne after Swissvax Full Detail, finished with Swissvax Zuffenhausen wax. The results simply speak for themselves, but using high quality products combined with good detailing technique, the final product has a big difference compared to regular waxes and products. Swissvax Autobahn - A Teflon wax designed to rims. Swissvax produces a large but prestigious range of products designed to provide the best care for each components of the car. Project Detail Sydney is the only authorised official applicator trained and dedicated its usage. Swissvax Scuderia - a bespoke wax handmade for softer Italian paintwork. If you would like your car to undergo the Swissvax treatment, contact us here and organise an inspection and quote at our Gladesville, Sydney Studio. Project Detail is now an official applicator for Swissvax in Sydney. We are proud to partner with the world's most prestigious car care product brand which has been manufacturing since 1930. We are grateful to be one of very few in Sydney to be an official applicator of Swissvax. Zuffenhausen - Designed for Modern Porsche paintwork with 40% Carnauba volume. Swissvax's dedication to innovation and quality is what attracted us to become an official applicator. We share the same core values and both our end results in a glossy perfect vehicle. Part of Swissvax's mainstay is their fantastic range of waxes. They have put timeless effort and research into designing combinations of waxes suitable for different makes of vehicles. Zuffenhausen - A Special blended wax designed for newer Porsche Finishes. Opaque - A thin and malleable wax designed uniquely for Matte and Satin Finishes. These Waxes afford the car a deep lustre that cannot be matched by a glass coating or any kind of synthetic sealant. This is why in an age of glass coating technology, Swissvax is still highly regarded today. Swissvax - High Performance Car Care. Swissvax - Caring for your Dream. Scuderia - Softer Ferrari & Alfa Romeo's paintwork glow when finished in this wax. Project Detail, uniquely uses Swissvax for a number of our services. Primarily, our Swissvax Detail service is a popular choice where not only is the full detail done on the vehicle, we utilise all Swissvax products; from the shampoo, the leather cleaner and conditioner and even the wheel cleaner. We then finish the Swissvax detail with your choice of wax, with certain types costing a premium due to their longevity or performance. Just like when we polish your car, we take hours and days perfecting the end result, so too is each pot of Swissvax. Individual serial numbers verify the authenticity and each pot over 70 years later, is still hand poured with pride. If you are located in Sydney, and would like the Swissvax experience for your vehicle, please contact us by clicking here and sending us a message today. Should I consider Paint Protection for my car? A lack of Paint Protection means your car is vulnerable to bird stains & swirl marks. For most of us in Australia, when we purchase a new car we are often offered a variety of paint protection options. The level of information provided also varies depending on the brand of product and unfortunately the honest of the salesperson. These same factors also dictate the cost too. VW Polo - Brand new car, clear is ready to fail due to bat droppings & no paint protection of any kind. Prolonged damaged requires Paint Correction. Lack of protection means faded & oxidised paint. To help you sift through the jargon and multitude of products available, Project Detail in Gladesville, Sydney will go over some of the options available for your car. Waxes are the oldest form of protection, these use a combination of Carnauba Palm Waxes, fruit oils and other ingredients. Waxes still provide the best in terms of gloss and depth. However one major downside with waxes is a lack of thickness, longevity and resistance towards longterm damage. To overcome the short lifespan of waxes, Sealants were developed. These can last months upto 12 months maximum which is a great improvement. However, the overall looks weren't able to compare to waxes. This option is most often offered by dealerships, even with a lifetime warranty the product will not last longer than 24 months on your vehicle. The most recent development in paint protection. Utilising advanced chemistry, the vast majority of coatings are based on Silicone Dioxide SiO2 aka Quartz or Pure Glass. These coatings come in many different brands and there is a lot of misinformation among them. However, one thing is clear, a good glass coating is a large step ahead from waxes and sealants. The gloss provided is almost of the same level as waxes, the lifespan is often between 2 -5 years and best of all they excel in the other attributes in UV protection and Hydrophobicity. Keep an eye out for our next blog post about glass coatings for more information. 2016 VW Mk7 Golf R in Limestone Grey - Brand new & protected with our Glass Coating protection. Depending on the make and model of your vehicle, your own budget and expectations should dictate which option you opt for. One important element to consider is with waxes and sealants, regular application (quarterly) is recommended to achieve the best results. Glass Coatings can be a cost effective solution due to their long lifespan. The top level coatings which deliver extremely well in each attribute listed above can become costly however. It is important to do good research and ask your detailer to find a protection product suitable for you and your car.